My final shape, my final form I'm sure I'm bound to find. "Be good with what you're given"
-potential hanging out plans with Jill! -having tickets to go to California in April! I have never been and I am really excited. -the Nerdist podcast. I have been listening to random insightful and funny conversations on my drives and walks. -Journaling. I've been doing a better job of logging my thoughts and hopes and whatnot and it just makes me happy. -random emails saying hi from people I learned from while student teaching. They probably did not realize how much joy such a small act brought! It is easy for my brain and heart to cling to worrisome things, but I am daily trying to slow down and notice all of the different ways I am wrapped secure. See how the morning breaks. but it's all our hearts can take." I miss you all so very much, and have been thinking of your faces daily! "Let my heart be filled with song"
Today at work there was this woman who was around her later 60s or early 70s. She was kind of diddly daddlying and poking around. I was stuck covering my department with nothing to do, so naturally I was watching her in a non-creepy way. Then suddenly she looked up and she got SO EXCITED. And BOOM. There was another woman looking to be around the same age. They hugged and were exclaiming about how happy they were to see each other. I guess one of them went on some sort of trip because some remark about "world traveling" was made. Later on in the day I found them pouring over a photo album in the corner of our cafe drinking coffee and eating cheesecake. It got me really excited because I get to have those reunions for the rest of my life too. Having friends scattered around kind of stinks. A lot. HOWEVER. What doesn't stink is getting the chance to be like those two women wildly remarking how happy they are in some random building. While being apart from friends is hard, it makes the reunions all the more better. I haven't read it yet but it looks delightful! 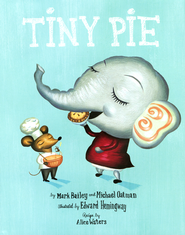 It's about an elephant feeling left out and finding her way in a mouse hole where the mice are holding a cooking show. I ordered it in today because I think the kids at my story time will really like it. Today was beautiful!! I've been stuck inside working all day, but Peanut and I were able to go on a longer walk/jaunt thing. It was a good end to a weird/crazy day. ...being a bridesmaid in one of my longtime awesome friend's wedding. It was a beautiful portrait of THEM and their love and life! ...working like a fiend. I received some small work news this past March which means I am getting more hours and am spending lots more time with all of the children things. Which is awesome and is why I have learned, that yes there is a Les Mis board book for kids and yes there really is a graphic novel called Annoying Oranges! ...schooling like a fiend. My last masters class is halfway over!!! And I just have one more education class this summer that starts soon, two big content librarian tests, and a few hanging out in school hours to finish up. Exciting! Scary! Overwhelming! ...in a constant state of shaky ground. I'm not really sure if I will graduate this semester or if I will technically have to wait for next fall. Little things like that keep happening and makes me SO appreciative of one of my school coordinators because I send her distress emails (MYCLASSGOTCANCELEDANDNOWIWONTGRADUATEANDTHENICANTDOMYCLINICAL-AHHHHH!) and then she makes everything better. ...reading a whollllleeeee bunch for class, for fun, for work, for my book club, and for fun. Last read was Name of the Star by Maureen Johnson. Super good! ...on a quest for... more. I don't know enough about my questing to be more specific. I am just trying new things in hope of new results. ...enjoying the fine company of fine people. Due to said wedding and future weddings I have been getting to see a lot of people that I think are really neat. And I like that. ...walking my dog!! I am trying a new thing where I walk my dog every day. We are explorers of the world! In other news, my new neighbors have a dog named Jenny. Sometimes they yell "JENNNNYYYY!!!" and sometimes I yell "WHATTT?" and then run away and hide because I realize they mean their dog. Not me! More cookie baking for this girl! I'm on the hospitality team for church, which means bringing in cookies once every few weeks. Thankfully I'm off work this Sunday and I can make it! Everything aligned perfectly. I ended up using a recipe from Skip to the Lue for S'more Cookies! They were super duper easy to make, although for some reason they ended up taking me forever. They don't taste like s'mores really, but they do taste good overall and have a neat texture with the chewiness of the marshmallows. My sister stopped through yesterday on her way to this Horn Fest going on in IL. It was exciting to see her! Unfortunately I'm pretty sure I won't see her again for a long while. She stops through again on Monday on her way back to Texas and I am gone all Monday. I work tonight, which I'm pretty excited to do actually. I'm planning on getting there an hour early so I can read more of The Fault in Our Stars by John Green. So far it is fantastic! I am also finally getting into my book club book, which is Game of Thrones by George R.R. Martin. It is one of those big ole honkers, but SO many people have been going crazy about it, that we decided to read it. Hopefully next month we will be choosing a way smaller book (for some reason we keep picking the longest books ever!). Miss you all sooooooooo unbelievably much. So today I made cookies for work and my parents! I found this recipe for Caramel Beurre Sandwich Cookies over at Cafe Fernando and they looked really good and actually doable. Mine don't look as classy as his, because I felt it needed sprinkles instead, but they actually turned out really good! A few tips and differences from my baking experience as opposed to his? 1. If you're going to make them for large amounts of people I would suggest making at least a double batch. I ended up with about 18 cookies altogether, which means I have to spread them kind of thin (one cookie for everyone!). The amount would have been perfect though if I were only making them for a small group. They're really rich, so they do last a while. 2. I would suggest not skimping on the caramel. It might vary depending on the type of caramel you use, but after trying one I wished I had used a little more caramel. 3. Instead of using the fancy French caramel he acquired I ended up using caramels bought at the grocery store and added some french vanilla creamer to it (fat-free to make the cookies "healthier" of course :P). 4. I had 0 cookie cutters so I ended up using a glass to make the initial round shape, and then I used a small wine twist cap to make the smaller cap. Overall I am really surprised though they actually turned out. This recipe was wayyyyy more doable than I initial thought. There was an old lady who swallowed a pot-- I KID YOU NOT! She swallowed a pot! Today on my commute the sky looked like it was painted! My "lingo" is going to be completely off, but essentially from my mind's eye it looked like in the background there was the gray overcast of toomanycloudsscrunchedtogether! whereas in the foreground there were white little puffy happy dappy clouds just poofing around. I really wanted to take a picture, but decided against it considering I was on a Chicago highway. Eep! For my commute I have started taking the toll roads due to the timeliness factor. Originally? This 100% terrified me. Actually, this whole process of grad school and being a real life competent adult has been terrifying. But I've been plugging onward and it is really neat to see my progress. A month ago I was white-knuckling (?) my steering wheel cringing at every car that passed me and imagining a terrible and horrible accident at every turn. Now it is comparable to going down a side street 20mph. Similar things are happening in my classes. As an undergrad it was like pulling teeth to get me to vocally participate in about 95% of my classes. I'm super fantastic at watching people talk, nodding, and taking notes in class. Anything that requires verbal communication? No way Jose! But get this friends. I. Actually. Talk. In. Class. I have been thinking a lot lately about this activity my small group leader has us do a few months ago. She provided us with these little cardboard boxes and we were supposed to write something on 3/4 of the sides. On one side we wrote BUILDING/PROVING and we were supposed to consider all the ways we build ourselves up and prove ourselves to ourselves and the world. (My name is Jenny, I am a girl, I work here and here and go to school and I enjoy this hobby and that hobby and this is what defines me) The second side we wrote IDENTITY, which I forgot what we were supposed to think about. The third side we wrote AVOIDING. If you're presuming we're supposed to think about "what are we avoiding" then yes, you are correct! Congratulations! The fourth blank side is supposed to mean something too, but I forgot it. Oops! This entire cardbox is a portrayal of how we define ourselves and box ourselves in. We are more than these walls we create around ourselves. We are more than our jobs and hobbies and friends and idiosyncrasies. It excites me, especially when it comes to having to do things I am afraid of. God makes me capable. Now I am tuckered out, so I am going to go dashing off in the land of dreams. 5. No class today-- hurray! 8. Iterate is a word!!!! And it is taking all of my will power to not use it in a formal paper. I am a reader extraordinaire! It only took me two tries to spell extraordinaire correctly. I like to read and listen to music and walk my dog and other things.